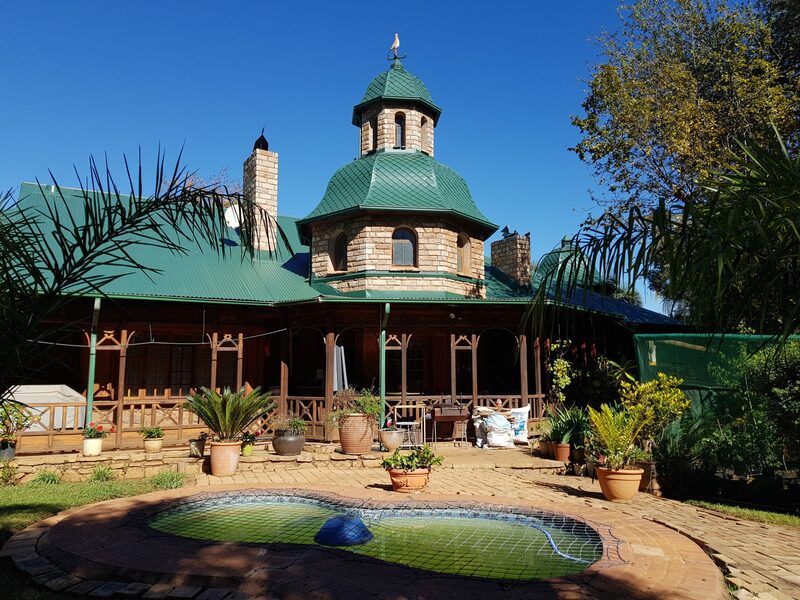 A charming Victorian homestead on a smallholding in Kameeldrift is ready to receive a new owner who will appreciate its grandeur and who will lovingly care for it. It might not have been built in the proper Victorian era (1837-1901), but it represents the architecture and design of that period well. And that is what the owner, a fine South African craftsman, wanted to present to his wife as a gift when he renovated the original old farmhouse of the Kievitskroon farm in the last years of the 1900’s. Boasting the typical towers and asymmetrical steeped roof structures with finials; bay windows and wrap-around porches with curlicue trim; beautiful timber window and door frames; stained glass windows and patterned wood and stone work; this house was built to impress – as was the idea of the Victorian period architects. To crown it all – displaying the significance of the original farm and the sense of humour of the then owner – this house has the image of a plover bird as weather-vane on the roof, referring to the Afrikaans name “kiewiet” after the original farm’s name, Kievitskroon. The interior of this beauty in Kameeldrift also displays the typical romantic, warm and dramatic characteristics of the Victorian period – fireplaces in just about every room, chandeliers hanging from the towers with their intricate woodwork and mosaic windows, patterned parquet floors and dodo rails. It even still has the original floral wallpaper. When the original farmhouse was renovated and modernised for twentieth century living, a huge en-suite main bedroom was added, as well as a modern kitchen. The beautiful stained glass doors that lead to the bedrooms and to the kitchen, were kept. The luscious garden with huge indigenous trees, benches hidden in corners amongst shrubs and plants, a waterfall with winding stream to a pond, a splash pool and braai area, contribute to the charming country lifestyle that this well situated property in Kameeldrift offers. This more than two hectare small-holding also boasts several outbuildings, amongst others a huge warehouse with inspection pit, two flats, six lock-up garages, a chicken-coop and duck pond, a sheep-fold and an established vegetable and fruit garden with a wide variety of fruit. Whether you want to enjoy the relaxed ambience of Kameeldrift’s bushveld atmosphere as extended family, or farm on small scale, this property will be a jewel in the crown of the right owner. Photos can’t tell the story. Come and see for yourself!